Home » Discipleship » Do you need encouragement today? Do you need encouragement today? As I pulled into the store parking lot the other day, a lady driving a van was attempting to pull out. She was in the middle of the drive, making it difficult for me to pull in. I was in a hurry and didn’t want to wait for her to exit. Anger rose up in me because she was taking up more than her share of space but, as I pulled even with her, she looked right at me and smiled the nicest smile. I couldn’t help but smile back at her. And I realized that my anger disappeared instantly! I went inside the store to pick up a few things. I shop there regularly, so I knew where to find what I’m looking for. Not so much that day, however. They were rearranging the entire store! I had to search up one aisle and down the other, then backtrack across the store for something else. Again anger rose up in me. I finally had to approach an employee to ask for something specific. He was very nice and helpful in spite of the chaos surrounding him, and I immediately thought of the lady in the van and her lovely smile. So I smiled at him and wished him a nice day. Again, the frustration I felt dissipated immediately! Later in the day, I had to go to yet another store. The employee at the check out was having difficulties with the register. I could see her frustration, so I looked her right in the eye, smiled a welcoming smile, and wished her a good day. When I walked away, she was smiling…and so was I. 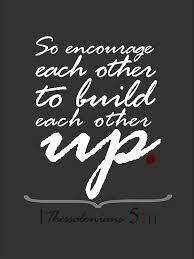 1 Thessalonians 5:11 says that we are to encourage one another and build one another up. Oxford dictionary defines “encourage” as to give somebody hope or confidence. My daughter has been the best example of this to me. For 10 years she worked for Chick Fil-A, a company known for their high standards for customer service. She learned to smile and speak kindly to each and every customer that came to her counter, regardless of how they treated her. One day we were at a store together and, as we were checking out, my daughter made a point of speaking to the cashier. I, on the other hand, just paid for my merchandise and and gathered up my bags without saying a word. As we walked away, she said, “Mom, you were kind of rude to that cashier, don’t you think?” Certainly I had not intended to be rude; I was simply preoccupied with my purchase. But my daughter was right. I had treated the cashier as though she wasn’t even there. Do you ever feel invisible? Has anyone ever just walked past you like you weren’t even there? Or ignored you in order to give attention to someone else who is nicer looking or seems more important than you? It’s very hard to have hope or confidence when you feel invisible or ignored. The good news is that Jesus never looks past you or me. He never acts like we don’t exist. Jesus loves us beyond measure. He loves us enough to sacrifice His life for us. Because I accept His sacrifice and believe His power to raise the dead back to life, I have every hope and confidence that I will indeed be with Jesus for all eternity. And it’s precisely because I have this hope and confidence that I can afford to share it with others. I can smile at anyone and everyone. I can acknowledge every person I meet and speak words of encouragement. So can you. If you know Jesus, you have the same hope and confidence of life forever with Him. You, too, can afford to encourage others. So as you go about your day today, look for opportunities to lavish encouragement on others. Give the gift of hope and confidence to everyone you encounter. Not only will you encourage them, but you will find yourself encouraged in the process! This entry was posted in Discipleship, Spiritual Formation and tagged 1 Thessalonians, confidence, encourage, encouragement, hope, resurrection. Bookmark the permalink. What a wonderful reminder. Choosing to be positive and give to others can make a huge difference in out own lives. Thank you, Rhonda! Yes, there is so much joy to be found in encouraging others…as you well know!